Here is a round up from the Hollywood Foreign Press Association’s annual Grants Banquet at the Beverly Wilshire Four Seasons Hotel on Thursday (August 13) in Beverly Hills, California. Jake Gyllenhaal: The actor looked as handsome as ever in this sharply tailored suit. Brie Larson: Her Oscar de la Renta dress was let down by some very bland footwear. Andrew Garfield: When looking at Andrew in his Dior blue suit, my only thought was, “I hope that moustache is for a movie”. John Krasinski: The actor looked sartorially elegant in Prada. Sarah Silverman: This Christian Siriano dress would’ve been a great look for Sarah had she been able to keep the twins under control. Joe Manganiello: The ‘Magic Mike’ actor was not so all black, as he opted for maroon shoes. 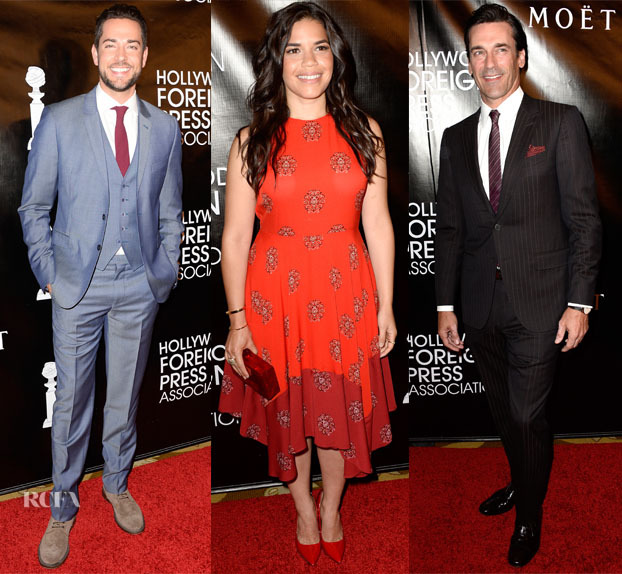 Zachary Levi: The actor was serving up traditional finesse once again in his Reiss suit. America Ferrera: I was delighted to see America – the girl who favours all-black – serve up this fiery red matchy look which included a dress from A.L.C. Jon Hamn: No matter how handsome Jon Hamn is, he can’t sell a pinstripe brown suit to me. Sophia Bush: We have seen a few tuxedo-inspired styles this week. Sophia kept up the trend with her Smythe dress styled with black pumps and a pop of colour via her emerald Edie Parker clutch. Saoirse Ronan: This Alexander McQueen kimono sleeve dress was a great idea, but it was let down by poor styling – namely the Sophia Webster booties.